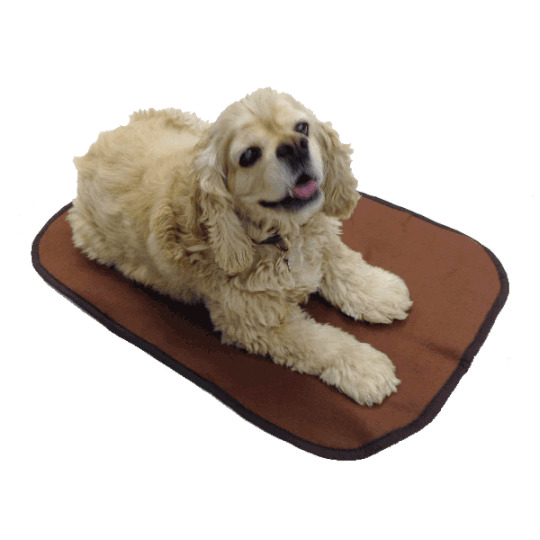 Self Warming Heating Pad Activates with your dog's body temperature for self-warming, natural relief. Made with Bamboo Charcoal Technology. Dogs are naturally attracted to our Achy Paws Self-Warming Dog Mat for its unique Bamboo Charcoal Technology that provides natural relief. It works by activating with their body temperature to bring light, restorative warmth to their achy joints. This can help increase blood circulation, which in turn, soothes tired muscles, reduces soreness, lower stress & anxiety, and melt away discomfort. The Achy Paws Self-Warming Dog Mat is simple and easy to use because once they step on it, the bamboo charcoal begins to activate. There is no danger of overheating because the sensation they feel is a light, warm tingling, which is much different than a heating pad. Plus, there's no plug in so it's completely safe. Just place the mat on your floor, sofa, bed, or car seat, and your pet will naturally gravitate to it, due to the bamboo charcoal inside. Also great for easing stress & anxiety for your pet when a new visitor arrives in your home, traveling in cars or planes, during cold nights, or thunderstorms. Can also be used in crates to calm their restlessness while traveling. You can also place it on furniture to help protect it. It's made with triple layered fleece that's comfortable for them to lie on. It's also safe, portable, and machine washable.